Our range features basic- and multifunctional timer relays. Multifunctional timer relays offer a range of functions which can be selected on the front side of the relay. The timing range can also be adjusted on the front of the relay. The relays operate at all voltages in the range 10.5 - 256V AC or DC (Brodersen) or 12 - 240 VDC, 20- 240VAC (Selec). 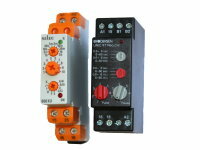 Brodersen timer relays are available for assembly on DIN rails or 11-pole plug-in, Selec for DIN rail mounting. Compact design and ease of use are features of the range of timer relays- whilst maintaining high quality standards. Timer relay with on delay. Fixed time ranges: 0.1-3 secs., 1-30 secs., 0.1-3 min. or 1-30 mins. The relay is available in different versions for both AC and DC power supplies. Single or double output relay, relay energizing indicated with LED. Versions available for assembly on DIN rails or 11-pole plug-in mounting. Symmetrischer Taktgeber. Symmetrical recycler. Fixed time ranges: 0.1-3 secs., 1-30 secs., 0.1-3 mins or 1-30 mins. The time range is selected using a rotary switch on the front side of the relay. The relay is available in different versions for AC and DC supply voltages. Single or double output relay, relay energizing indicated with LED. Versions available for assembly on DIN rails or 11-pole plug-in mounting. Timer relay with delayed pulse for automatic star/delta- motor starter. Fixed time range: 1.5 - 60 secs. The time range is selected using a rotary switch on the front side of the relay. The relay is available in different versions for AC and DC supply voltages. Single output relay, relay energizing indicated with LED. Versions available for assembly on DIN rails or 11-pole plug-in mounting. Multifunction timer with 13 functions and 10 time ranges. Easy setting with three front knobs. Time ranges from 0.1s to 3h. The relay is connected to a supply voltage of 20-240VAC 50/60Hz or 12-240VDC. One output SPDT (1C/O) with activation LED. DIN-rail mounted. Multifunction timer with 5 functions and 4 time ranges. The function and the time range are selectable via 2 front mounted rotary switches. The time ranges cover 0.6sec.-60min. or 0.6min.-60hrs. The time is adjustable on the timer front. The timer can directly be connected to the supply voltage in the range of 10.5-265V AC/DC. Multifunctional timer relay with 4 functions and 4 time ranges. The function and time range are selected using two rotary switches on the front side of the relay. Time ranges: 0.6-6 secs., 6-60 secs., 0.6-6 mins., 6-60 mins. The area is adjusted on the front side. The relay can be connected directly to a supply voltage in the range from 10.5- 256V AC/DC. Single or double output relay, relay energizing indicated with LED. Versions available for assembly on DIN rails or 11-pole plug-in mounting. Multifunctional timer relay with 5 functions and 4 time ranges. The function and time range are selected using two rotary switches on the front side of the relay. Time ranges: 0.6-6 secs., 6-60 secs., 0.6-6 mins., 6-60 mins. The area is adjusted on the front side. The relay can be connected directly to a supply voltage in the range from 10.5- 256V AC/DC. Single or double output relay, relay energizing indicated with LED. Versions available for assembly on DIN rails or 11-pole plug-in mounting. Asymmetric recycler with 2 functions and 4 time ranges. The function is selected by mounting a jumper and the time range is selectable via a rotary switch on the front side of the relay. The pulse and pause time ranges from 0.6 secs - 60 mins. or 0.6 mins - 60 hrs. Pulse and pause times can be adjusted separately on the front side. The relay can be connected directly to a supply voltage in the range from 10.5- 256V AC/DC. Single or double output relay, relay energizing indicated with LED. Versions available for assembly on DIN rails or 11-pole plug-in mounting. Asymmetric recycler for energizing with 4 time ranges. The time range is selected using a rotary switch on the front side of the relay. The pulse and pause time ranges from 0.6 secs - 60 mins. or 0.6 mins - 60 hrs. Pulse and pause times can be adjusted separately on the front side. The relay can be connected directly to a supply voltage in the range from 10.5- 256V AC/DC. Single or double output relay, relay energizing indicated with LED. Versions available for assembly on DIN rails or 11-pole plug-in mounting. .